allows you to order machined or 3D printed parts directly from the software. Design parts for cars, motorcycles, bikes, watercraft, skateboards, aircraft, toys, robots, musical instruments, optical devices, remote control vehicles, drones, electronic devices, clocks, machinery, engines, furniture, games, jewelry, jigs, lighting, medical devices, photography accessories, sporting equipment, tooling and more. 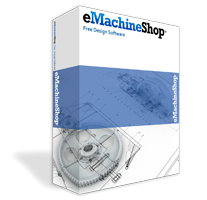 *Though eMachineShop CAD can model rounded edges and complex shapes and curves, it is not designed for modeling complex multi-dimensional curves such as those found in biology (e.g. people, faces, animals, flowers and highly sculpted shapes). *Mac Users: Use Bootcamp or Parallel desktop. Then install Windows and eMachineShop CAD.